600pm - 1000pm Thu, 100pm - 1000pm Fri, 1100am - 1000pm Sat, 1100am - 600pm Sun. Featuring Live Music - Croosroad Station, Six to Noon, Smoke and Mirrors, Seven Mile Bluegrass, and Ross County Idol and Junior Idol. Chillicothe, Ohios first capital city, rich in Indian history, hosts the annual Feast of the Flowering Moon Festival. Started in 1984, the festival draws crowds of approximately 85,000. 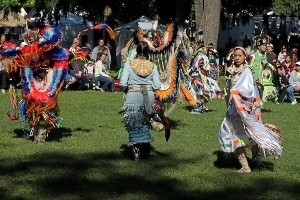 Yoctangee Park, in historic downtown, makes a perfect setting for this family oriented three-day event featuring Native American music, dancing, traders and exhibits, a mountain men encampment rendezvous with working craftsmen and demonstrations, an extensive arts and crafts show with over 80 crafters and commercial exhibits. Entertainment is continuous on the main stage with good food, fun, games and contests for the whole family to enjoy. This is an educational experience for the entire family. Handicap parking is available at the Feast. The handicap parking will be from the Alley of West Water by crafts etc glad tidings to Walnut St. All events are FREE to the public.